A very enjoyable brief stay. Excellent stay. Exceptional customer service. Great location. it was clean, neat, tidy and the staff were very helpful. Breakfast was included in our stay and it was yummy and plenty to eat. I would definitely return to this hotel for my next city stay. Great location, helpful staff. Love the eco friendly ethos! Lounge area really lovely. Friendly helpful cheerful polite staff at reception and in restaurant. hotel and bedroom very clean. Bed very comfortable. Room was quiet. Enjoyed our stay at hotel. I had a lovely stay at the Alto. Very comfortably, friendly and convenient. Thank you for the upgraded room. I will definitely be returning. Excellent, we enjoyed the whole experience! The reception staff were amazing, very helpful, especially Andrew. The breakfast was lovely and the staff very good. Our room 309 was very quiet as requested. We loved our stay and would definately recommend this hotel to our families from the country. Enjoyed my stay with friends. Clean and nice furniture and toilet. This was our third stay at Alto Hotel On Bourke, previous stays being for 2 adults and 2 children, and we would be very happy to stay again and recommend Alto to our friends and family. We have always felt very welcome and enjoyed the convenience of an area which is so close to transport, restaurants, shops and other Melbourne attractions. The room was well appointed and very neat and clean. One bed overlay did have some leftover brown makeup (probably bronzer or tanning lotion), the window blind was crooked and probably needs a little adjusting. But these things are very minor in my overall view. I left a note regarding a light globe needing replacing and was very happy to return later that afternoon to find this had been attended to. I do not travel a lot, but would certainly name Alto Hotel On Bourke as one of the best home away from home places I have stayed in. Also three of the best nights sleep I have had in a long time. Great beds! Like sleeping on a cloud. Clean and well appointed loft apartment served by lift to the 4th floor. However, there had been no mention in the description at the time of booking that the 2nd bedroom (of the 2 bedroom deluxe loft apartment) had no window. Free parking was conveniently located in a secured compound about 200m away. 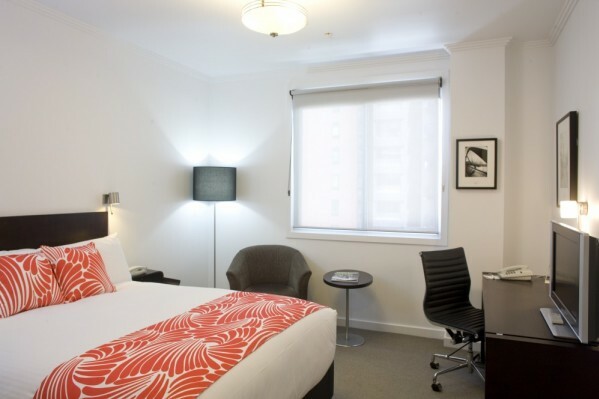 Centrally located on Bourke Street with 5 minutes stopping/parking place immediately outside hotel for arrival and departure. Friendly and helpful staff; free coffee at reception; an enjoyable stay and would recommend. We have stayed at the hotel many times and it is always great to return. Clean, comfortable, stylish, friendly and safe - thank you! Friendly staff good location. Overall a positive experience. Have recommended hotel to friend and family in Sydney. Small frustration getting wifi on iPhones. Suggest that you sort that wrinkle out. I made an excellent choice just based on other internet reviews. The room was spotlessly clean. The kitchenette was a pleasant surprise. Very convenient to the train/bus station and all the shops and grocery stores. I picked your smallest room, but the room and bathroom were plenty big enough for me. I wish I had made a point of getting the name of the young man who was so helpful to me getting me hooked up to the internet on my lap top. I think his name began with an "A". Andy? Andrew? A young Asian man. Very knowledge and helpful. We've stayed in a few hotels the last few weeks- this was without doubt the friendliest, most pleasant check in experience we have had. The staff were kind, friendly, nothing was too much trouble and we were even given a complimentary upgrade. Superb location - good value for money- clean- the most comfortable bed- what more could you want! Staff were dedicatef to the guests comfort and needs. A very enjoyable stay. I would recommend the Alto Hotel to my friends and family if they were travelling to Melbourne. The relaxation room was an added bonus. I would love to stay again. Wonderful as always. Staff are very friendly and I always feel safe and secure when I am staying there. It also feels like a second home, as the staff are so welcoming. I would really like to say how wonderful all the staff are, but especially Gemma . Only stayed a short time. I appreciated that my flight was delayed leaving Melb. the staff allowed me to stay and watch telly and to use the massage room. Much appreciated as this rejunvenated me and was able to go out and continue to shop! Glad you liked the beds. We have have had so many comments like yours that we have arrange with our bed supplier to be able to take order for the same designed bed with or without the deep pillow top mattress in any size you like. Delivery available to anywhere in Australia. Comfortable and the perfect location for my needs this visit. Fantastic as per usual. Everyone at the Alto is always helpful and as always the room was wonderful. We have stayed here several times. Loved upgrade to 3 bedroom apartment. Loved location. Loved Melbourne. All good. A good locatiion for my visit. Staff friendly and the free wifi much appreciated. The experience was excellent. We'd never stayed at that end of town before and would again now that we stayed at Alto. The only slight negative (and it wasn't) was that one of the waitresses in the hotel restaurant was not very friendly. Other than that, it was simply great! It was a great experience, except I stayed there to have a break from being woken up overnight by my 2 1/2 year old (who was at home with his dad), but was then rudely woken up by a loud bang outside my bedroom in the early hours of the morning, followed by lots of loud footsteps. It may have been a guest but it seems more likely to have been one of your staff members at that time of morning on a Sunday. A very pleasant experience from end to end. Great to see a property so well maintained and with such attention to detail. Staff were great. Terrific value.